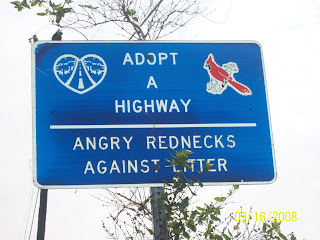 Drivers beware: the Commonwealth is now enlisting "angry Rednecks" into its anti-litter brigades (or are they battalions, Senator Biden?) so throwing trash on the road may become an even greater risk to one's health! Remember, these "bitter" folks "cling to guns or religion" so won't have any problem taking care of scofflaws. In the name of Jesus of course.